TSPSC Gurukulam Subject wise Art,Craft,Music Teacher posts Vacancies in TREIS, TSWREIS, TMREIS, TTWREIS, MJPTBCWREIS Recruitment 2017. 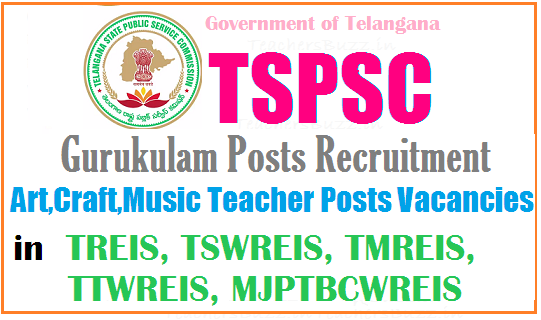 TSPSC gurukul recruitment notification 2017, TSPSC Recruitment Art,Craft,Music Teacher posts vacancies in Telangana gurukulams, Subject wise Art,Craft,Music Teacher posts vacancies for TSPSC Gurukulams Recruitment 2017, TSPSC gurukul teachers recruitment Subject wise Art,Craft,Music Teacherposts vacancies, gurukulam wise , category Art,Craft,Music Teacher posts vacancies for TSPSC Telangana REI Societies Recruitment, Subject wise PET, PD posts vacancies for TSPSC TS Residential Schools Recruitment, TSPSC Gurukulam Art,Craft,Music Teacher posts vacancies recruitment 2017. Art,Craft,Music Teacher posts vacancies details are given here. Art teacher, Craft teacher, Music teacher Examination likely to be held on April 2, 2017.The commission reserves the right to conduct the examination either Computer Based Recruitment Test (CBRT) or Offline OMR based examination of objective type.